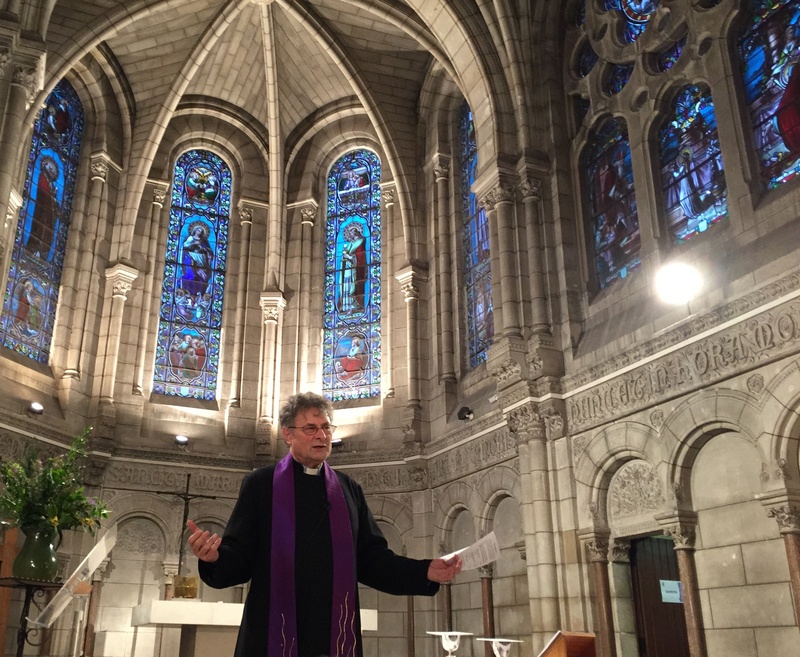 On Good Friday evening, we were led in our meditations by members of the congregation reading/performing monologues by Frank Topping. These are powerful aids, looking at the events of Good Friday from different witnesses’ points of view. We were grateful for the silences to focus our thoughts. The Choir sang four anthems, giving us welcome breathing spaces in between the drama. We finished with a brief Iona communion service. We were delighted to welcome a church full of all ages, coming together to worship the living God. Again, the Choir were in fine voice and we were delighted to have the Children’s Choir also contributing to our worship with Give Thanks for the second hymn and Father we love you after the sermon. Andrew had prepared a large screen showing the depressing picture of what could be seen on Good Friday evening and into Holy Saturday. Then Alexandra mustered all the children who carried the very large wooden cross down the nave and ‘charged’ the screen, destroying the depressing picture, to show the power of the cross extending beyond what is seen into the realm beyond. As it was pouring with rain, the Easter egg hunt organised by Anne Sharp took place indoors. Everyone enjoyed helping the children find their trophies. 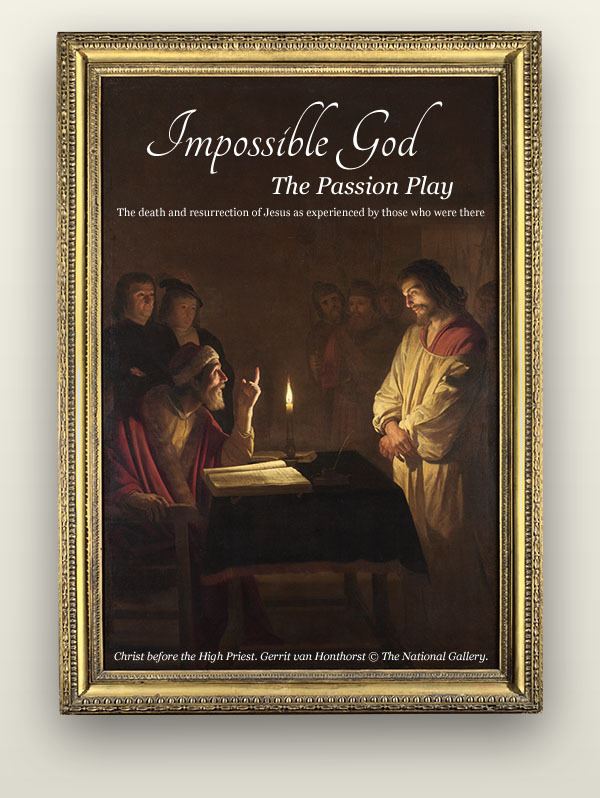 The book, ‘An Impossible God’, is Frank Topping’s attempt to put flesh on the bones of the characters who appear in the Passion stories. He says “I am not a systematic theologian, but an extremely unsystematic pilgrim whose reason seeks answers to experience; who has found that his reason limits his exploration, and wishes, not unreasonably, to go beyond. Grant them eternal rest, O Lord, and may light eternal shine upon them. A hymn is raised unto Thee in Zion, and a vow paid to Thee in Jerusalem: give ear to my prayer, O Lord, unto Thee all flesh shall come at last. Lord, have mercy! Christ, have mercy! Lord, have mercy! Little Lamb, who made thee? Dost thou know who made thee? Gave thee life, and bid thee feed By the stream and o’er the mead; Gave thee clothing of delight, Softest clothing, woolly, bright; Gave thee such a tender voice, Making all the vales rejoice? Little Lamb, who made thee? Dost thou know who made thee? Little Lamb, I’ll tell thee Little Lamb, I’ll tell thee; He is called by thy name, For he calls himself a Lamb. He is meek, and he is mild. He became a little child. I, a child, and thou a lamb, We are called by his name. Little lamb, God bless thee! Little lamb, God bless thee! The Lord is my shepherd; therefore I can lack nothing. He shall feed me in a green pasture, and lead me forth beside the waters of comfort. He shall convert my soul and bring me forth in the paths of righteousness, for his Name’s sake. Yea, though I walk thro’ the valley of the shadow of death, I will fear no evil; For thou art with me: Thy rod and thy staff comfort me.